Wheatland Spring Farm + Brewery has been in the works for some time. The historic Wheatland Spring property was unknown to us when we started this journey over a decade ago, but in many ways, it couldn’t be anywhere else. We’re not sure if we found our way here through hard work, a little luck, or providence. Maybe all three. We’re also not sure how we arrived here matters as much as why we’re here. Living in the heart of Munich for several years, we were lucky to experience first-hand Bavarian brewery culture. Stepping out of our front door some mornings, we might catch barley mash wafting through the air. Biking to our local beer garden, celebrating birthday parties, wedding receptions, and even baptism parties were at our local brewery. We developed an understanding of and appreciation for how much breweries are integrated into the culture. City or countryside, many breweries have been in the same place for generations. These community institutions are public houses in the truest sense. Our favorite local breweries are so much a part of the community’s fabric that they are a collection of their surroundings: people, history, culture, food, tastes, ingredients. Like few other institutions, the local brewery is able to capture its place in the world, becoming a timeless community anchor in the process. At once, it’s all about the beer and not about the beer at all. There’s an aspect of this experience, in particular, that made a lasting impression on us: the German concept of Gemütlichkeit. It’s a sense of friendliness, warmth, peace of mind, coziness, and contentment. This genuine feeling of belonging was so powerful for us that we had to share it with others. Living in Munich afforded us the chance to stop by countless breweries across Europe. We visited breweries that were big, small, urban, rural, conveniently located, impossible to find, and we enjoyed every one of them for different reasons. Underneath the unique local patina was a common foundation: the brewery captures the soul of its place in the world. In the process of being inspired by breweries that are centuries old — with some older than the United States, itself — we’ve been soaking in details that create the mosaic a person experiences at their local brewery. We’re combining our collection of tastes, experiences, and traditions from European breweries with the ideas, energy, and spirit of a historic American farm that’s been reborn. This fusion lies at the heart of our approach. Wheatland Spring Farm + Brewery represents the marriage of our experiences, ethos, and collective possibilities, all with a reverence for our shared American and European brewing traditions. The brewery is our sincere interpretation of what a European small farm brewery from the 1800’s would be if operating in Wheatland today. Our ingredients come from our farm, neighboring farms, and regional small batch producers as much as possible. In 2019, we’ll harvest our first 18 acres of estate wheat, with additional acreage going into fruit, vegetable, and herb crops. 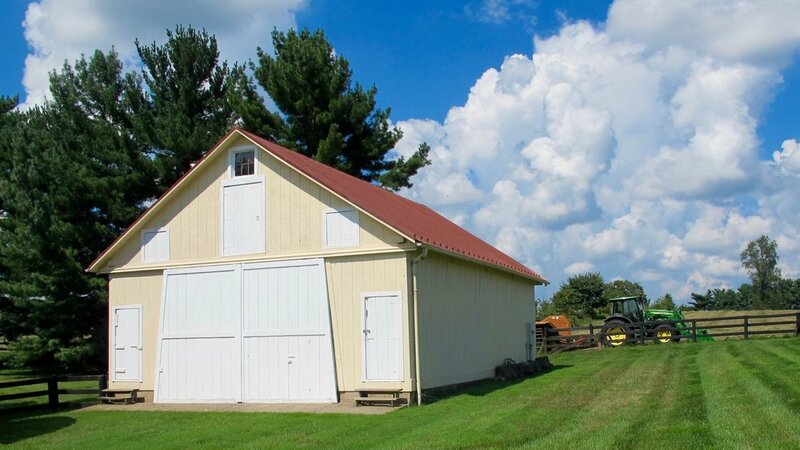 After harvesting produce from our fields or receiving fresh produce from our neighboring farms, ingredients are dropped off in our 1870’s Bank Barn for processing. Depending on the crop, processing could take a few hours, if freshness is vital, or a few months, if drying is required. The crop will make its way into our small batch brewhouse in the 1920’s Corn Crib, to be combined with the property’s natural water source for brewing. The source of the equipment used to process regional ingredients is also important to us. Once in the brewhouse, the ingredients are combined to brew beer by hand on a small batch brewhouse made in Portland, Oregon of U.S. steel. We’ve even shaken the hand of the master welder who built our brewhouse. The beer is served from kegs also using U.S. steel and made in Pottstown, Pennsylvania. Wheatland Spring Farm + Brewery makes Land Beer. We take our cue from German Landbier, or “country beer.” In our approach, we’ll use regional malts, estate ingredients, wild and domesticated yeasts, and water from the property to realize our take on Land Beer. Our beers are meant to celebrate Wheatland Spring and its region. They’re intended to be enjoyed with an experience that feels familiar and inviting every visit. In other words, Gemütlichkeit.